You may have heard the legend that good oysters are available only during months that contain an "r" in their name and that those months constitute oyster season. The rule dates back to the days before refrigeration when oysters could spoil quickly. These days, you can enjoy oysters throughout the year, but it is still important to know in which months oysters are in season and where you can get the tastiest oysters that won't leave you feeling ill.
Perhaps the best reason to only buy oysters during the fall, winter, and spring—the "r" months—is related to the creature's reproductive cycle. Oysters spawn in the warm summer months, usually May through August, although in the Gulf of Mexico, oysters spawn year-round because of the warm water. Spawning causes them to become fatty, watery, soft, and less flavorful. Oysters that are shucked in the colder months instead have a more desirable lean, firm texture and bright briny flavor. In recent years, bacteria such as Vibrio parahaemolyticus have caused illnesses in several harvesting areas of the eastern United States throughout the summer months. The bacteria are not unique to oysters; high levels can also be found in tuna, mackerel, and other seafood. There's a particular concern about this bacteria and oysters because they are eaten raw. So the presence of Vibrio puts another tick in the column of eating oysters only in cooler months. 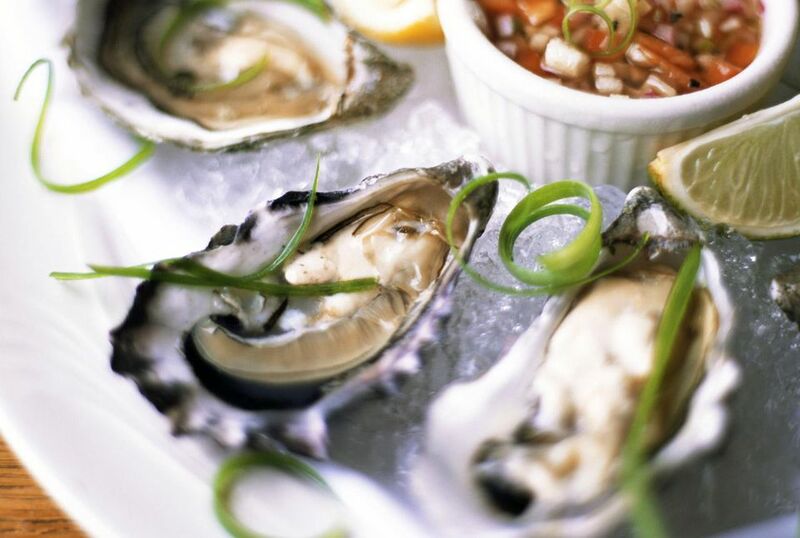 Thanks to refrigeration, you can ignore the "r" rule and consume good oysters in spring and summer without incident. You can get them from cool waters or from farms, which gives them optimal flavor even in a month without an "r." In fact, a new genetic procedure being used by some commercial oyster farms renders farm-raised oysters sterile, so they don't spawn at all. These prime oysters are available for year-round enjoyment. The answer about oyster season depends on several factors. You have to know your oyster. If you feel confident that you are getting a fresh oyster from a cool-water location, you should have a tasty oyster that will not make you sick any time of year. Likewise, if you are in a state along the Gulf of Mexico, have no fear if you are barbecuing or whipping up some oysters Rockefeller. Warm-weather bivalves pose no threat in that situation. When you're dining on local catch, though, it's best to note the weather. If that's the case, you may want to stick to the old "r" rule—better safe than sorry, right? If you have decided the time is right to buy some oysters, choose those that are heavy and full of water. They must be sold live, and live ones will be clamped shut or will clamp shut when they are tapped. A dead oyster will have a loose shell and should be avoided at all costs. Oysters taste the best when they are eaten within 24 hours of when you buy them, but you can store them in the refrigerator for up to five days in a mesh bag or open container covered with a damp cloth and large shell down.